Chad VanGaalen : Infiniheart now back on wax! 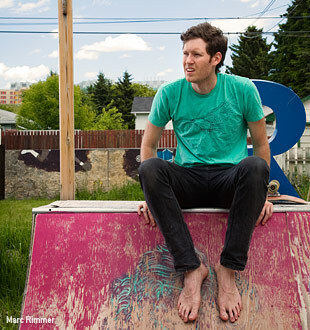 From his teens to early twenties, Chad VanGaalen worked in his bedroom studio amassing hundreds of songs, selling CD-Rs with crudely assembled covers while busking on the street. In 2004 we compiled a collection of these enigmatic and infectious songs as Chad’s debut Infiniheart, and it went on to bring Chad acclaim from all over the damn place. This haunting and personal album – despite never being intended for such widespread listenership – has never lost its status as a cult favourite, and Infiniheart is now available again on vinyl. The 2011 pressing of the double LP is limited to 1000 copies on pink vinyl, and is available in stores across Canada and online on the Flemish Eye mail order store now.